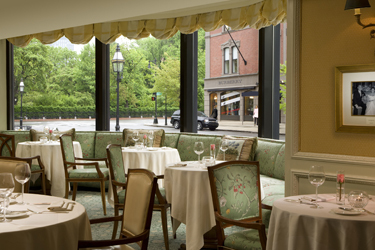 The Cafe at Taj Boston, at Arlington and Newbury streets, is the ideal choice for inventive dining experiences. Here, in this intimate space with expansive windows that inspire Boston's best people-watching, you'll enjoy New England's finest meats, seafood and produce prepared with international flair. Fall's bounty takes center stage in new menus from Executive Chef Frank Steigerwald, whose innovative seasonal dishes reinforce his philosophy that meticulous attention to quality and freshness of ingredients is paramount. Whether you're relaxing after shopping along fashionable Newbury Street, planning a pre-theatre dinner or gathering friends and family for a festive celebration, you'll enjoy his signature taste of autumn with Mediterranean flavors that often includes a subtle hint of the East. East also meets West in the daily specials created by Taj Boston's Indian culinary experts. Specialty dishes are authentic favorites from diverse regions throughout India that capture the fragrant essence of "Spice Route" cuisine.